The Bible prophecy seems to allude to two scenarios for the War of Gog of Magog, the final war in this world. Two main Biblical prophets – Zechariah and Ezekiel – foretold messages about the War of Gog of Magog, a key event that sets the stage for the imminent arrival of the Messiah. The prophet Zechariah lived after the destruction of the First Temple in Jerusalem. He wrote about a war (Zechariah 12-14) that will take place in the last days of the world as we know it. His description of this war resembles the war Ezekiel wrote about in chapters 38 and 39 – the war of Gog of Magog – although he had not specifically called it under that name; in his prophecy, the War of Gog of Magog is the darker of the two. According to Zechariah, Israel will be the focus of the mysterious ruler Gog of Magog, with the battle being waged in Jerusalem. It is an old and widespread view among the Bible commentators, that the words also upon Yehudah will it be above express the participation of Yehudah (Israel) in the siege of Jerusalem. In what follows, however, there is no indication whatsoever in Zechariah’s prophecy of Israel’s having a common goal with the enemy of Israel against Jerusalem. As it evidently appears in the prophecy, this is a contradiction in terms. Contrary to this common misconception, Israel and Yerushalayim stand together in opposition to the nations of the world, and the leaders of Israel have strength in the inhabitants of Yerushalayim, and destroy the enemy to save the city. See also Appendix K, The New Holocaust. The statement above that YHVH will save the tents of Israel first, that the splendor of the house of David may not lift itself up above Yehudah, contains the simple thought that a deliverance from the enemies will take place in such a manner that no part of the nation will have any pride above the other, and that because the deliverance is by no human power, but by the omnipotence of Elohim alone. In other words, this thought may be expressed in the following way: the vulnerable and defenseless part of Israel will be delivered first, then the inhabitants of Yerushalayim, so that the city may not lift itself up above the country, but at the end both may recognize that the victory belong to Elohim alone who will shield Yerushalayim (Zec_12:8). Adad-remmon is a city near Jerusalem, which was formerly called by this name, but is now called Maximianopolis, in the field of Mageddon, where the good king Josiah was wounded by Pharaoh Necho. This statement of Jerome is confirmed by the fact that the ancient Canaanitish or Hebrew name of the city has been preserved in Rümuni, a small village three-quarters of an hour to the south of Lejun (Legio = Megiddo see in Jos_12:21). The mourning of Hadad-Rimmon is, therefore, the mourning for the calamity which befell Israel at Hadad-Rimmon in the death of the good king Yoshiyahu who was mortally wounded in the valley Megiddo, according to 2Ch_35:22. The death of this most pious of all the kings of Yehudah was lamented so bitterly, that the prophet Jeremiah lamented on his death as seen in 2Ch_35:25. Zechariah, therefore, compares the lamentation for the putting of the Messiah to death to this great national mourning in Yerushalayim. This is one of the controversial passages in Zechariah which is allegedly said to mean, that two-thirds of the nation of Israel will be killed in the war, from which the idea of the second Holocaust is derived. However, the idea that two-thirds of Israelis will be killed can hardly be found in the whole context Zechariah 13; and what these two verses may actually relate to is all the land, kol ha’aretz. In Hebrew, the phrase kol ha’aretz may refer to the land of Israel, but also to all the earth. In support of this supposition, the word “Jews” is never mentioned in any form in this passage. Moreover, according to Rabbi Tovia Singer, “the end of Zechariah is devoted to describing the salvation of the righteous gentiles at the End of Days and the destruction of Israel’s arch enemies who wage war against Jerusalem”. What Singer is saying is that “the two thirds” that will die in the wars are the enemies of Israel and “the third” that will survive are the righteous from all the nations. They are the ones who shall call on His Name and shall say YHVH is My Elohim. This reading of Zech 13:8-9 is not without ground; on the contrary it has its merits because this is what we actually can find in the final book of the Scripture, the Revelation. We read that at the opening of the fourth seal over a fourth of the earth will die and at the sounds of the sixth trumpet another third of mankind will perished, which makes two thirds of the nations will die in the world holocaust. Thus, the numbers of those who will be cut off and die in Revelation will be close to the two thirds in Zech 13:8-9 (over twenty-five percent in Rev 6 plus thirty-three percent in Rev 9 equals over fifty-eight percent). And if we have to include those who will die from the plagues unleashed during the other seal-trumpet-bow sets before Messiah’s coming, then the total number will make up the two thirds that will die according to Zech 13:8-9. The remaining one third of the nations will be of those who will be left from all the nations which came up against Yerushalayim, and we may suppose also some of the small nations which have not come up against it. They will be the ones that will go up from year to year to bow themselves to YHVH, and to observe the Festival of Sukkot (Zec 14:16). Therefore, we may say that considering the overall context the end-day prophecy in Zech 13:8-9 is referring to all the earth, not only to the land of Israel, as the prophecy in Revelation clearly indicates that: of the earth. In the day of battle of YHVH as in the day of the Exodus. The escape. “The day of battle” spoken of in the prophecy already occurred in the Exodus story when Elohim intervened at Yam Suph (Red Sea) to save Israel from the Egyptians. Mosheh assured the people that Elohim would fight for them and they would never again see their enemies, the Egyptians. And indeed, in His plan YHVH first separated the Israelites from their enemies: the pillar of fire moved from in front of the people to behind them thus separating them from the Egyptians. This separation prevented the people from seeing their enemies. After being separated from them, they were able to flee to safety on the opposite shore prior to the destruction of the Egyptians. 1. the separation occurred blocking the people’s vision of their enemies and their enemies’ vision of them. 2. Elohim then revealed a path of escape for the people having parted the sea. 3. They fled and survived the danger prior to YHVH’s destruction of their enemies. We have the reason to believe that this battle plan of YHVH may be repeated again in the Greater Exodus this time for the final battle at Armageddon, when He will gather all the nations against Israel (see also Joe_3:2, Zep_3:8, Rev_16:14). (3) and on the day of battle of YHVH, when the Gentiles armies will be destroyed, it will be twilight (Zec_14:7), but at the end of the day there will be light. 1. Separation of the people from their enemies by darkness. 2. Splitting the sea in the first Exodus and the mountain in the Greater Exodus. 3. Providing a pass for the escape. 4. Escape in the midst of the mountains as the Israelites fled in the midst of the sea. 5. As then and now people will have all night to escape. 6. As then and now, the escape will be in darkness, but the destruction of the enemies in light. 7. Elohim again will fight for His people. And just who will flee in the second Exodus? In every country, city, or village around the world, when YHVH decides that the time has come, He will separate His faithful from the evil that surrounds them, and thus providing them a path to flee to safety and freedom, and then He will destroy the enemies. As then and now all of the escape must use that opportunity and flee without delay and looking back as Lot’s wife did when he and his family escaped the destruction of Sodom and Gomorrah. Speaking of Lot’s escape, it is also important to note how Elohim separated Lot from the Sodomites: (1) By having His messengers stretch out their hands to bring him into the house, (2) then they blinded the attackers (as the Egyptians were blinded by the pillar of fire) and took him and his family outside the city, and (3) told them to flee for their lives and not to look back. This fact, that Lot was brought outside the city in order to flee, is a key clue in solving the mystery of the Greater Exodus. This key clue was given to the last generation as an example to learn from, as we may recall the words of the Messiah to flee the city when the abomination takes place. However, along with the above said similarities, there some new elements. The new element in the second Exodus will be: you shall not come out in haste, nor go in flight, as the exodus from Egypt was. come out of her midst: Out of the midst of the exile, for all these last consolations refer only to the last exile. for… goes before you: Two things at the end of this verse explain two things in its beginning, [viz.] For not with haste shall you go forth. What is the reason? For the Lord goes before you to lead you on the way, and one whose agent advances before him to lead him on the way his departure is not in haste. And not in the flurry of flight shall you go, for your rear guard is the God of Israel. He will follow you to guard you from any pursuer. It is clear from Rashi’s understanding of Isa 52:11-12 that this refers to the last days, as the whole chapter of Isaiah 52 indicates the same, and more particularly to the Greater Exodus. What seems to be a new element in the Greater Exodus, however, is that those who will come out of her (Babylon) will not flee (they will not do it in haste as in the day of old when they came out of Egypt) for He will lead and follow them to guard them from any pursuer. This new element in Isaiah’s prophecy is what will startle many nations and their rulers, for they will see and understand that YHVH is behind all of this and that He protects His people (Isa_52:15). However, only part of the people, regardless of where they are, will make it. In Zec_14:2 we see, for instance, that even in Yerushalayim not all people will be safe: half of the people in Yerushalayim will go out into exile, but the rest will not be cut off from the city. Those who will be found in the city will be trapped and surrounded by the opposing armies and will not have the chance to flee. But those who will flee outside of the city (like Lot and the disciples) will have the opportunity to run to safety for three and half years, as Rev_12:14 clearly indicates it. On the other hand, we may reason, if the goal of YHVH is to validate the reality of Him in the eyes of the world, and the truthfulness of Torah to all those who question it, would He not protect His people in the Land of Israel from their enemies? Would He abandon His children who have made sacrifices to live in His Land under the constant threat of war and terrorism, and would He not spare the faithful? So, why would YHVH allow all of this? The only reason why He would allow Israel’s enemies to overcome them [temporarily], as the present author sees it, is that the threats of surrounding hostile nations are a means to bring Israel to a complete repentance and final redemption, lest they be subject to the powers of their enemies. If Israel does not repent willingly, Elohim will appoint over them a cruel leader, like Haman in Persia (a mullah in modern day Iran) who threatened to destroy them. However, if Israel repents, the Messiah will come to deliver them. Either way, Israel will come to repentance, one way or the other. Now, let us learn a lesson of the canary. Back to the day of coal mining when gas leak could cause explosions in the mine, the miners were keeping a canary in a cage with a person assigned to watching the bird. At the first sign of the bird dying, the miners knew that an explosion was imminent and that they would immediately evacuate the mine before they would be buried under the rubbles. From the end time prophecy we learn that Israel has been described as “the canary of the world” meaning that when Israel becomes the objects of persecution and hate, the air has been poisoned and an explosion is soon to come. The hate towards Israel has never ceased since the time of Edom. However, since 2001-2002 with the Palestinian Intifada that hate has become more and more intense. This could only mean that the explosion in the mine, the war of Gog of Magog, is about to take place and the evacuation from “Babylon” is imminent. Let us also consider the prophecy in Micah. The prophet Micah continues to prophesy about what will take place after the war of Gog of Magog (the final war in Eze 38 and 39), the war which precedes the coming of the Messiah and the Final Redemption of Israel (Mic_5:5, Mic_7:11-15). Ashshur (Assyria) is a type of the nations of the world by which Israel is attacked, because in the time of the prophet Ashshur was the imperial power by which Israel was endangered. Against this enemy Israel will set up seven and eight leaders of some kind, who will drive the modern-day Ashshur back, and press victoriously into its land. However, what is mean by seven shepherds and eight leaders in the prophecy in Micah, the present author does not know. This interpretation of Mic 5:2-7 parallels with Zec 12:5-6 where we see again the leaders of Israel fighting back its enemies. If this is correct, then, it seems that the siege of Israel by foreign armies will take place about nine months before the war of Gog of Magog which precedes the coming of the Messiah and the Final Redemption. In such a case, this will place the beginning of the siege during the feast of the festival of Hanukkah and its end nine months later at the sounding of the sixth trumpet in the autumnal festivals, the appointed times of YHVH. And these are a few additional thoughts for reasoning as to how the Mount of Olives will split, as seen in Zec_14:1-7. The Promised Land lies immediately adjacent to the Syria-African Rift Zone, the deepest known break in the earth’s crust. Archaeological evidence suggests that the earthquake “in the days of Uzziah” king of Yehudah might have had a magnitude greater than 7.0 that had caused this break in the earth’s crust. Rabbi Yitzchak Batzri, a noted Kabbalist from Jerusalem, spoke about how the wave of earthquakes fits into the Messianic process. The potential of earthquakes is in the world from the first days of creation, but the power that brings it into existence is God’s will. That will is triggered by human action. Our actions, in relation to God, affect his decision to enact the forces of nature, especially in things having to do with our rejecting sanctity. King David wrote, ‘Who looketh on the earth, and it trembleth; He toucheth the mountains, and they smoke’ (Psalm 104:32) to describe what will happen in the End of Days before the final redemption. There will be an earthquake in Israel, but it will be beneficial, opening up the Temple Mount, bringing forth living waters, purifying the city to receive the Messiah. The Rabbi’s understanding of the prophecy is supported by the science. Indeed, Israel sits on the Syrian-African Rift Zone, which runs along the Dead Sea Valley. It passes through the area thought to be the sites of Sodom and Gomorrah, and the city of Yericho, which still stands today. The Biblical accounts of the destruction of the twin cities of evil, and the later account of the falling walls of Yericho, could very well be interpreted as heavenly powered geologic catastrophes. Also, the Prophet Yonah (Jonah) was a contemporary with King Yarovam of the Northern Kingdom at the height of his power, or towards the end of his rule as seen in 2Ki_14:23-25. In the Book of Yonah we see huge respect from non-Hebrews for YHVH (Jon_1:8-10). They became exceedingly afraid when they learned that Yonah was a Hebrew; the men in the ship were not Hebrews. They had set out from Yoppa which in that era most likely was in Philistine territory. This exceeding fear makes sense, if in very recent history Elohim had been shown to be very powerful over the Philistines, over the Ammonites, Arabia and all the way down to Egypt. And indeed, in the first years of Uzziah’s reign, in Yoppa, which was so close to the events, even a foreign sailor would have heard how YHVH had helped Uzziah by destroying Philistine cities by the earthquake. Yonah then was told to go to the Great City of Nineveh (Jon_3:4-5). Why did the people of this great and mighty city believe Yonah, when he told them to repent, as they did? At this time Nineveh was a center of Assyria which was rising to be a great power. Something must have made them greatly fear and respect the Elohim of the Hebrews. The great earthquake implied in the Chronicles record might have been a good reason for the Ninevites’ fear. The trade route from Egypt to Babylon went past Nineveh. If the Egyptians spread the news of Uzziah’s name, it would travel to Nineveh. The mighty king of Nineveh clearly feared the Elohim of the Hebrews (Jon_3:6-9). It must have been the great earthquake clearly linked to Uzziah’s reign that took the fame of Uzziah’s name to Egypt and the fear of the Hebrew Elohim from Yoppa to Nineveh. A great earthquake is also referred to in the book of the prophet Amos. Amos dated his prophecy to “two years before the earthquake, when Uzziah was king (Amo_1:1). Over 200 years later, the prophet Zechariah predicted a future earthquake from which the people would flee as they fled in the days of Uzziah. The earthquake of Uzziah must have been something that was engraved in the nation’s memory, and was still fresh 250 years from the event. Uzziah’s long reign of fifty-two years was the most prosperous excepting that of Yehoshaphat since the time of King Shlomo (Solomon). He was a vigorous and able ruler, and his name spread abroad, even to the entering in of Egypt (2Ch_26:6-14). The earthquake made Uzziah even greater in the eyes of Yehudah’s enemies. What kind of great earthquake makes a people great? Possibly, the one that destroys only their enemies. In Isa_2:19-21 Isaiah speaks of a future earthquake, but clearly referencing something the people knew about. What Isaiah writes makes senses, if the generation Isaiah was speaking to in the latter half of Uzziah’s rule remembered when Elohim shook the earth and destroyed their idolatrous enemies, the Philistines. Therefore, the earthquake spoken of in Zec_14:4-7 brings to mind the one in the time of King Uzziah which destroyed the enemies of Israel, but spared Israel. Would that be repeated again in our days? According to the prophecy, it will. Though Magog is mentioned in the Bible as one of the early descendants of Noach, the identity of his descendants is unknown with certainty. The name “Gog”, however, does not appear anywhere in the Tanak itself, but in Ezekiel only and therefore remains a great mystery that been subject to much speculation. The understanding, though, is that according to the Talmud, Gog of Magog will be an enemy of the Jewish people, who will march against them and specifically against Yerushalayim. In order to decipher the prophecy in Ezekiel, we need to see who is who in the war of Gog of Magog. Or, in other words, who are the key players in chapters 38 and 39 of Ezekiel. Gog: The only place Gog is mentioned outside of the Book of Ezekiel is in 1Ch_5:4 and it refers to an Israelite with the same name (this person is not to be confused with Gog in Ezekiel). Thence we can conclude that “Gog” is a personal name, not a nation or a land. LXX (the Greek translation of Tanak) frequently introduces the name of Gog, where the Hebrew original has something else. Thus, in Num_24:7, for instance, it replaces King Agag (a descendants of Amalek, of Edom), with Gog; in Amo_7:1 the Greek has Gog as the leader of a threatening locust-like army. By no means LXX has the same authority as the Hebrew Tanak, but it gives us the understanding how the ancient sages viewed the mysterious figure Gog of Magog. Therefore, we may say, that Gog is an individual and a leader of a country, as Ezekiel clear identified him so: Gog of the land of Magog. Magog: Son of Yapheth, son of Noach: Magog, is the collective name of a people descended from Yapheth mentioned in Gen_10:2, and according to the early Jewish tradition, this is the great Scythian people. In Ezekiel it is written with the article, probably to mark a people well known to the Hebrews from the time of Genesis, and therefore properly referring to the land of the Magog-people. However, there is an alternative reading of the phrase Gog of the land of Magog which in Hebrew is literally written like this: גוג Gog ארץ land המגוג the Magog. Since Magog is identified with a definite article the and it is not in plural form to identify people, it cannot be translated as a personal name, but as being the land [of] Magog. Notice also, that the verse does not say Gog from the land Magog, as if Gog originates from that land, but Gog of the land Magog. This can only mean that that mysterious person, Gog, represents the land Magog in power and authority, or somehow he is associated with it. Consider also the following passages below from the Book of Yasher, quoted in the Book of Joshua. Yasher 7:1-7: And these are the names of the sons of Noah: Yapheth, Ham and Shem; and children were born to them after the flood, for they had taken wives before the flood. These are the sons of Yapheth; Gomer, Magog, Madai, Javan, Tubal, Meshech, and Tiras, seven sons. And the sons of Gomer were Askinaz, Rephath and Tegarmah. And the sons of Magog were Elichanaf and Lubal. And the children of Madai were Achon, Zeelo, Chazoni and Lot. And the sons of Javan were Elisha, Tarshish, Chittim and Dudonim. And the sons of Tubal were Ariphi, Kesed and Taari. Jubilee, IX. 7-8. And Yapheth also divided the land of his inheritance amongst his sons. And the first portion came forth for Gomer to the east from the north side to the river Tînâ; and in the north there came forth for Magog all the inner portions of the north until it reacheth to the sea of Mê’at. Also, in the Rabbinical writings one can find another phrase for Gog of Magog: Gog and Magog. However, this is a misnomer, as this phrase cannot be supported by the Hebrew text, since it implies that there are two persons: Gog and Magog in the prophecy in Ezekiel. However, what we find in Eze 38:2 JPS is “Gog of the land of Magog”, or in short Gog of Magog. The description “Gog of Magog” better depicts the idea of the person Gog of the land of Magog, therefore the present author uses this term, rather than “Gog and Magog”. Gomer: Son of Yapheth. There is a general consensus among Bible scholars and historians that Gomer was comprised of nations located in Asia Minor, south of the Black and Caspian Seas and parts of central Asia: Uzbekistan, Kazakhstan, Turkmenistan, Turkey, and Chechnya. Gomer was well known in the ancient world as Gimarrai or Cappadocia in north central Asia Minor. The people were also known as the Cimmerians. Gomer is the area in what we know as Central Turkey. Although all of them are Muslim countries today, only Turkey and Chechnya are hostile to Israel and unless Chechnya breaks out from the Russian Federation Turkey will be the only one of this region to go to wage war against Israel. Togarmah: Son of Gomer, great-grandson of Noah. Togarmah is revealed in Assyrian records as Tilgarimmu. Tigarimmu was a city state in eastern Anatolia, modern day Asia Minor in southeastern Turkey near the border with Syria. Yasher 10:6 And the sons of Yapheth the son of Noah went and built themselves cities in the places where they were scattered, and they called all their cities after their names, and the sons of Yapheth were divided upon the face of the earth into many divisions and languages. 7 And these are the sons of Yapheth according to their families, Gomer, Magog, Medai, Javan, Tubal, Meshech and Tiras; these are the children of Yapheth according to their generations. 8 And the children of Gomer, according to their cities, were the Francum, who dwell in the land of Franza, by the river Franza, by the river Senah. 9 And the children of Rephath are the Bartonim, who dwell in the land of Bartonia by the river Ledah, which empties its waters in the great sea Gihon, that is, oceanus. 10 And the children of Togarmah are ten families, and these are their names: Buzar, Parzunac, Bulgar, Elicanum, Ragbib, Turki, Bid, Zebuc, Ongal and Tilmaz; all these spread and rested in the north and built themselves cities. 11 And they called their cities after their own names, those are they who abide by the rivers Hithlah and Italac unto this day. 12 But the families of Angoli, Bulgar and Parzunac, they dwell by the great river Dubnee; and the names of their cities are also according to their own names. Meshech: Son of Yapheth. According to Eze_27:13, both Meshech and Tuval were trading partners with ancient Tyre (Eze_27:2), in what is today Lebanon. A closer study of these names reveals that Meshech and Tubal are the ancient Moschi/Mushki and Tubalu/Tibareni peoples who dwelled in the area around, primarily south of, the Black and Caspian Seas in Ezekiel’s day. These nations today are in modern-day Turkey, possibly parts of southern Russian and northern Iran. Meshech was located near what was known as Phrygia, in central and western Asia Minor, while Tubal was located in eastern Asia Minor. Both form portions of Turkey. Yasher 10:13-14: And the children of Javan are the Javanim who dwell in the land of Makdonia, and the children of Medaiare are the Orelum that dwell in the land of Curson, and the children of Tubal are those that dwell in the land of Tuskanah by the river Pashiah. And the children of Meshech are the Shibashni and the children of Tiras are Rushash, Cushni, and Ongolis; all these went and built themselves cities; those are the cities that are situated by the sea Jabus (Gen_10:5, Eze_39:6) by the river Cura, which empties itself in the river Tragan. Consider also the alternative reading Meshech being an Ishmaelite of Arabia, thus a descendant of Shem, son of Noach: Psa_120:5-6, Gen_25:13, Isa_21:16-17, Isa_60:7, Jer_2:10, Jer_49:28, Eze_27:21. The Bible refers to Ishmael using the name Kedar. Literally, Kedar was a son of Ishmael. Tuval: Son of Yapheth. See above. Tuval’s (Eth, Tobel) portion seems to extend from Thrace to Italy. Josephus, Ant. i. 6.1, identifies Tuval’s descendants with the Iberes who lived in the Caiicasus, and the Chronicles of Jerahmeel, xxxi. 5, identify them with the Iberi and Ispamia. It is not clear what the three tongues of land are. Italy seems to be the third, Greece the second and possibly Thrace the first since Gen_10:5 identifies the sons of Yapheth as the coastland peoples of the nations. As Italy seems to be the third tongue, Meshech’s portion extends from the north of Italy to Cadiz. Josephus, Ant. i. 6.1, and the Chronicles of Jerahmeel, xxxi. 4, take the descendants of Meshech to be identified with the Cappadocians, but modern scholars with the Moschi who lived between the sources of the Phasis and Cyrus. Many authors, following the Jewish historian Josephus, related the name to Iber. Concerning the question of the ethnic affinity of the population of Tubal, Josephus wrote: “Tobal gave rise to the Thobeles who are now called Iberes” – Caucasian Iberia.” However, Jerome and others stated another tradition that Tubal was ancestor to not only Iberians, but also the ‘Italians’ [i.e., Italic tribes] and ‘Spanish’ [who were also called Iberians]. The Caucasian Iberians were ancestors of modern Georgians. Persia: Modern day Iran. Iran was called Persia until 1935, and many Iranian Americans still refer to their nationality as Persian when asked where they are from. Tiras son of Yapheth in Gen_10:2 is Persia — from Gen. Rabbah ad loc., Yoma 10a, but per Josephus they are the Thracians. Cush: Son of Ham, son of Noach. Many Bible translations interpret Cush as Ethiopia, but modern day Ethiopia is not the area that the Bible associates with Cush. Egypt will become a desolate wasteland. Then they will know that I am the Lord. “‘Because you said, “The Nile is mine; I made it,” therefore I am against you and against your streams, and I will make the land of Egypt a ruin and a desolate waste from Migdol to Aswan, as far as the border of Cush.” Egypt borders Cush. The Nile river flows into the southern border of Egypt from the modern nation of Sudan, known officially since 1989 as the Islamic Republic of Sudan. Therefore, Cush is Sudan. Put: Son of Ham. Put is the area west of Egypt. The Septuagint translates the word Put as Libue. It is Libya, Algeria, Morocco and Tunisia. Antiquities of the Jews, Book 1:6:1. Now they were the grandchildren of Noah, in honor of whom names were imposed on the nations by those that first seized upon them. Japheth, the son of Noah, had seven sons: they inhabited so, that, beginning at the mountains Taurus and Amanus, they proceeded along Asia, as far as the river Tansis, and along Europe to Cadiz; and settling themselves on the lands which they light upon, which none had inhabited before, they called the nations by their own names. For Gomer founded those whom the Greeks now call Galatians, [Galls,] but were then called Gomerites. Magog founded those that from him were named Magogites, but who are by the Greeks called Scythians. Now as to Javan and Madai, the sons of Japheth; from Madai came the Madeans, who are called Medes, by the Greeks; but from Javan, Ionia, and all the Grecians, are derived. Thobel founded the Thobelites, who are now called Iberes; and the Mosocheni were founded by Mosoch; now they are Cappadocians. There is also a mark of their ancient denomination still to be shown; for there is even now among them a city called Mazaca, which may inform those that are able to understand, that so was the entire nation once called. Thiras also called those whom he ruled over Thirasians; but the Greeks changed the name into Thracians. And so many were the countries that had the children of Japheth for their inhabitants. Of the three sons of Gomer, Aschanax founded the Aschanaxians, who are now called by the Greeks Rheginians. So did Riphath found the Ripheans, now called Paphlagonians; and Thrugramma the Thrugrammeans, who, as the Greeks resolved, were named Phrygians. Of the three sons of Javan also, the son of Japheth, Elisa gave name to the Eliseans, who were his subjects; they are now the Aeolians. Tharsus to the Tharsians, for so was Cilicia of old called; the sign of which is this, that the noblest city they have, and a metropolis also, is Tarsus, the tau being by change put for the theta. Cethimus possessed the island Cethima: it is now called Cyprus; and from that it is that all islands, and the greatest part of the sea-coasts, are named Cethim by the Hebrews: and one city there is in Cyprus that has been able to preserve its denomination; it has been called Citius by those who use the language of the Greeks, and has not, by the use of that dialect, escaped the name of Cethim. And so many nations have the children and grandchildren of Japheth possessed. Now when I have premised somewhat, which perhaps the Greeks do not know, I will return and explain what I have omitted; for such names are pronounced here after the manner of the Greeks, to please my readers; for our own country language does not so pronounce them: but the names in all cases are of one and the same ending; for the name we here pronounce Noeas, is there Noah, and in every case retains the same termination. Insert: The term Scythian the sons of Magog found above was used to refer to a variety of groups from the Black Sea to southern Siberia and central Asia, or modern-day Russia. “They were not a specific people”, but rather variety of peoples referred to at variety of times in history, and in several places, none of which was their original homeland. The Bible includes a single reference to the Scythians in Col_3:11, immediately after mentioning “barbarian”, possibly as an extreme example of a heathen people. With all probability, the Scythians could refer to the people who inhabit today’s Southern Russia. The word for north in Eze 38:2-6, Hebrew tsaphon, is not to be considered always literally as one of the direction of the world especially when reading the prophecy; tsaphon does mean north as seen in its simple usage in the Scripture. They craftily plot against Your people, And conspire against Your treasured (tsaphon, hidden) ones. In this verse tsaphon can hardly be translated as “northern ones”, but as treasured ones referring to Israel, as one hides his treasure from being seen or discovered. On the night of Pesach, for instance, the afikomen the observant Jews eat at the end of the meal is called tzafon צפון because it is hidden throughout the entire Passover seder. Insert: The Ancient Hebrews related the four compass points to their geography in relation to the land of Israel. The word for East, for instance, is קדם (qedem), which is the place of the rising sun. The word for South is נגב (negev), which is the desert region to the south. The word for West is ים (yam), which is a word meaning sea and refers to the Mediterranean Sea. And most importantly for our study, the word for North is צפון (tsaphon), which comes from a Hebrew root literally meaning “hidden” probably alluding to the idea that the northern regions were unknown to the Hebrews. Insert: In the rabbinical tradition one who recites the Shemoneh Esreih should face mizrach — east. However, the Gemara (Bava Batra 25b) says, “If one desires to become rich, ‘yatzpin’ — he should turn towards tzafon — northeast.” Since the word tzafon does not only mean “north,” but also hidden, the sages are possibly intimating that if one wants to be rich, yatzpin — he should act modestly and not show off his wealth in the eyes of the public, but he should hide it, hence he will show modesty. See also chapter The Prophetical Psalm 83 in Part II of this study for more on this. Gomer and all its bands, the house of Togarmah from the covered hidden (place) and all its bands, many peoples with you. With that being said, in chapters 38 and 39 of the Book of Ezekiel, Gog of Magog is generally understood to be a political and/or military leader and Magog is his country. The true identity of this leader has been veiled in mystery for many centuries. Our goal, however, is to unveil this mysterious figure as much as possible, because he will be the one who will lead foreign armies in war against Israel. Where is the land Magog? The first step towards this goal is to identify the country Gog comes from, namely Magog. Then, once this country has been identified, it will be relativelly easier to identify Gog himself. Gog of Magog is identified as the one who shall be turned around, and hooks shall be put into his jaws, and shall be led with all his army from a covered and hidden (place). Therefore, the intention of Elohim here is probably to identify Gog of Magog as one hidden and unknown to the Israelites, hence his country is also hidden and unknown. Today, there are three possible contenders for the land Magog, the land of Gog, and we will explain each one of them, as we will try to find a sound judgment as to who Gog of Magog is. However, first we need to know that in the Scripture all directions of the world are given from Yerushalayim and in Ezekiel 38, it does not make any exception. If one draws a straight line going north from Yerushalayim, it will pass first through Asia Minor, modern-day Turkey. However, the people which inhabited that land can hardly be called unknown to the ancient Israelites, since the Hebrews knew them very well. Therefore, Turkey can hardly be Magog despite what some commentators believe today. Going further north, the line is crossing the land occupied by the ancient Scythians, and we come to the first contender for Magog, the land of Gog: the modern-day Russia. Since the land Magog lies north of Israel, many if not all commentators have assumed that Magog must be Russia, because the text also emphasizes that Magog is at far or extreme north, and what would be farther north from Israel than Russia. Also, Russia is so far north that part of it lies beyond the Arctic Circle. Therefore, many conclude that Magot is Russia and Gog of Magog must be Russia’s president Vladimir Putin. In addition to this, they argue, Russia has recently become deeply involved in the Middle East, particularly with the war in Syria, which also lies to the north of Israel. However, as in the case of Turkey, the ancient Scythians who occupied the land were also well known to the Hebrews, since Apostle Shaul quoted them. Since, that land and its occupants were well known to the Hebrews as being Scythians, we may say that they were not really hidden from them, therefore Russia can hardly be a strong contender for the land Magog, and therefore, Vladimir Putin cannot be Gog, either, despite the overwhelming opinion of number of end-time prophecy commentators. And if we keep on going north, according to the direction given in Ezekiel, we are passing Russia and what is then farther north from Russia? It seems there is none. With this we come to the second contender for Gog of Magog. But before that we need to take into account some events that will help us come closer to the obscure land Magog of Gog. In August 2015, Russia of Vladimir Putin formally staked a claim to a vast area of the Arctic Ocean, including the North Pole. If the UN committee that arbitrates sea boundaries accepts Russia’s claim, the waters of the North Pole will be subject to its oversight on economic matters, including fishing, oil and gas drilling, although Russia will not have full sovereignty over the ocean. Under a 1982 UN convention, the Law of the Sea, a nation may claim an exclusive economic zone over the continental shelf abutting its shores, if the shelf extends far out to sea. 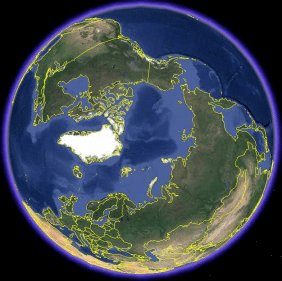 The claim Russia filed was based on that provision and argues that the shelf extends far north of the Eurasian land mass, out under the planet’s northern ice cap. We should note that was not the first attempt for Russia to claim the North Pole. Russia submitted a similar claim in 2002, but back then the United Nations rejected it for lack of scientific support. In response, in 2007, a Russian submarine planted a titanium national flag of Russia on the seabed beneath the North Pole to claim its sovereignty on the North Pole. We should also note that during the Cold War, on the old Soviet maps, the dotted line of the Russian frontier stretched from the country’s eastern and western borders to the North Pole and for generations the Soviets have considered this vast ice desert as part of their territory. Whether that was legal is not the issue here; it was a reality of the Cold War no one wanted to dispute. Now, however, is different. It seems that Russia is better prepared this time to acquire the North Pole and, therefore, to qualify to be a land of the north today than in 2002. So, the battle for the North Pole has begun. Whether UN will respect Russia’s claim for the North Pole is not of a big significance; Russia already took it with no one to contend it, or is it so? On the other side of the North Pole, this provocative act had not been left unnoticed by the U.S., Canada, and Norway. After a decade of surveying the country’s eastern and far north seabeds and gathering supporting evidence, Canada filed a UN application seeking to vastly expand its Atlantic sea boundary and signaled intentions to claim the North Pole. This led the Russian President Vladimir Putin to follow suit by ordering his country’s military to step up its presence in the Arctic, amid competing claims by countries that also include Norway and Denmark. Therefore, Russia and Canada have come to the point to have overlapping claims to both the North Pole as well as large territories of the Arctic that the US Geological Survey thinks could hold thirteen percent of the world’s undiscovered oil and up to thirty percent of its hidden natural gas reserves. How could that help understand the prophecy of the mysterious land Magog, the land of Gog? The Arctic Ocean is not like the other water bodies on the globe. For the major part of the year it is frozen and becomes a vast extension of the dry land with its ice roads and villages. By overtaking the pole, Russia claimed it to be its own. Whether this act is legal or not, is not the issue here. The issue is that by taking the North Pole Russia has become a land of the north related to the U.S. However, the opposite is also true: the U.S. has become a land of the north as related to Russia and therefore a land from far north as related to Israel, as the Northern hemisphere is seen from above the North Pole. Let us recall again that “north” means hidden (place) or “tsaphon” in Hebrew, with which we came to the second contender of the land of Gog, the land Magog. In the hidden message encoded in the prophecy of Ezekiel (Eze_38:2-3), which we will see below, we will come to the logical conclusion that that land is the land of Gog. In support of this contender for being a land far north of the land of israel, let us also consider that Eze_38:13 recounts two channels of merchandise, Raamah on the Persian Gulf, and Sheba on the Red Sea in Arabia. The name Dedan still remains in Dadan, an island on the border of the Persian Gulf. Therefore, that land Magog, from the extreme north of Israel, in Ezekiel 38 and 39 is well known to the merchants in the Persian Gulf, today’s Iran, since “Magog’s tank ships are not strangers to them. Again the question is, which country lies farther north from Israel and from Russia, and is known to Iran for its oil merchandise whose tankers cross the seas to bring petrol in the land of Magog? The logical conclusion, we are comming to, is that that country locates north of Russia and therefore far north of Israel, and this can only be the U.S.A. Only then the hidden message of the Bible code in Eze_38:2 revealing the identity of the mysterious Gog of Magog could be understood in the context of the verse itself. We know that Gog will come from a remote country which is beyond the horizon, hidden from Israel, as if from the other side of the earth, the opposite of the land of Israel. This can also be clearly seen in the parallel end-time prophecy of Isa_5:26 and Isa_13:4-5.
Who is this mysterious Gog of Magog from the far north? These translation and interpretation are groundless from Hebraic perspectives and will not be discussed here. The Hebrew word rosh means “head, first, ruler, top, chief or main”, and has never been used as a personal name in the Hebrew Tanak. As for the identity of Meshech and Tuval, refer to their description above. Now, let us return to the prophecy and more particularly to a hidden message of the Bible code concerning Gog of Magog in these two verses in the Hebrew text of Ezekiel, discovered in 2008 by Dr. Robert Wolf and Joel Galis from Redemption5768 Ministry. Starting from the last letter alef of the ninth word in Westminster Leningrad Codex, נשׂיא which means prince, ruler, … or president in Eze 38:2 and counting every seventh letter from right to left, we will find the word אובאמה in Hebrew, or obama. And this is how the name Barack Hussein Obama is spelled in Hebrew: אובאמה חוסיין ברק . Or, in Israel it is spelt in modern Hebrew like this: אובמה which basiclally is the same word but a variant of spelling of “Obama” in modern Hebrew as it is acceptable for a foreign name to be spelt in different ways. Is Barak Hussein Obama “Gog of Magog” prophesied by Ezekiel? According to the prophecy he is either Gog of Magog, or somehow this name “Obama” will be involved in the end time events. “Obama” will be the one involved for the final war of Gog of Magog when the chief ruler of Magog will seek to divide the land of Israel, by giving the so-called West Bank to the Palestinians. If the land of Magog is the U.S. located in a hidden place beyond the North Pole or far north from Israel, then Gog of Magog in the prophecy is “Obama”. The opposite is also true: since “Obama” is encoded in this key passage concerning Gog the ruler of Magog, then the land Magog is America. We can only speculate how exactly this person will be involved in the war of Gog of Magog, not if. The third contender for Gog of Magog who will come against the land of Israel is no less surprising. More likely, says Winston, is that Obama would fulfill the role as the leader of an international force. “He could interfere with Israel more successfully with an international mandate than he could as a president of a single country, even if it is the main superpower… ,” he suggests. As said in a previous chapter of this book, the UN does not possess the real power to govern the world, that is why the present author calls the United nations a “shell”. However, the United Nations is not toothless puppet in the hand s of the global elite that rules the world behind the scene. Obama has conceded Israel’s right to exist in secure and recognized borders, but these borders have been predetermined by Obama to be based on the 1967 lines, with agreed swaps and as the UN Secretary General he would have the leverage to implement the UN Security Council resolutions. It is very unlikely that the current Israeli government would agree with such “a deal.” This “revolt” of Israel may lead to sanctions and expulsion from the UN and/or even the possibility of military intervention by the UN. And this is why this could be a possible scenario for the war of Gog of Magog in the last days. “..the Security Council shall determine the existence of any threat to the peace, breach of peace, or act of aggression” and shall decide what measures shall be taken”.”So the UN shall make the decision as to whether and when it shall act militarily. Clearly, a nation that resists at being controlled by the UN will be deemed to be a threat per the UN’s own definition of peace quoted above. Therefore, the UN has authority under this section of its Charter to wage war to accomplish its idea of “peace”. The recent history is full of such examples; the Korean War, for example. Rabbi Pinchas Winston’s suggestion is not without ground. It has historical precedents in the destructions of the First Temple in the Jubilee year of 3350 and the Second Temple in the Sabbatical year of 4028 and consequently in the destruction of Yerushalayim (note the key years in the Creator’s calendar), when foreign or “international” troops took major part of it. The Babylonians and later the Romans used auxiliary and mercenary troops (understand international troops) in the sieges and desolations of Yerushalayim. It could be very possible that an invasion of international armies can happen again this time under the banner of the UN. Notice that in Article 42 the UN armies can be authorized to perform blockade and operations by land and sea, as the international armies of Babylon and Rome had already done it in their times. So, according to Rabbi Winston’s scenario, Gog of Magog sitting in his headquaters in New York City (from the far north) may summon international auxiliary armed forces (this is what the UN military forces are), or he may use national armed forces, that of the U.S. and Iran (see again Eze 38:2-6) to do the job. The employment of national armies to invade a sovereign land is not without a precedent since this had been used already in the Korean War when the U.S. interfered in the Korean conflict under the mandate of the UN. What would be more different now than what has happened then? In support of the above, we may add that during his final year (as of 2016) in the White House, it looks like President Barack Hussein Obama is preparing a personal surprise for Israel and for Prime Minister Benjamin Netanyahu. This may come in the form of a UN Security Council resolution on the Israeli-Palestinian conflict. Several U.S. officials have said that Obama has grown so frustrated with trying to revive Middle East “peace talks” that he may lay down his own outline for an Israeli-Palestinian two-state solution, in the form of a resolution in the United Nations Security Council, thus fulfilling Rabbi Pinchas Winston’s suggestion concerning Obama’s UN engagement. And there may be a great deal of temptation to do something like this in the final year of Obama’s presidency. For a president who has done so aggressive policy on the Middle East scene than any of his predecessors and has so little accomplishment, there may be a sense of incompletion and perhaps even failure. Israel’s former envoy to the UN Ron Prosor says that in recent days there are meetings in the White House on how to end Obama’s second term and the Israeli-Palestinian conflict in particular. In the light of this, it is very possible that the U.S. will not use its veto in the Security Council to stop French or other countries’ proposals on recognizing a Palestinian state or on how to end the Israeli-Palestinian conflict. And if this is what will transpire, Obama would support a UN Security Council resolution calling for a Palestinian state. This option of non-exercise of the U.S. veto can be used between November 2016 and January 2017, so as not to hurt the campaign of the Democratic presidential nominee which is being held in 2016. Retired ambassador and former deputy director general of the Foreign Ministry Gideon Meir argued that the arrival of judgment day, when the U.S. turns to the UN Security Council on the Middle East conflict, is just a matter of time. There is a pattern of behavior for the U.S. administration, he continues. And indeed, Obama will not want to harm Israeli security by way of cutting off the U.S. economic security package. Such a move is unlikely since it will hurt the interest of the U.S. military industrial complex and his Democratic Party’s presidential campaign. However, the present author’s opinion is that Obama will want to leave a legacy of “peace” because he came onto the world stage as a peacemaker, and he was even “rewarded” for a Nobel Prize without doing anything for the world peace. So, where can he do this? Only at the UN. Formally, in order to justify such a move, Obama will want to set out parameters or some kind of framework that will ensure the continuation of the U.S. diplomacy for the two-state solution and the American commitment to this idea in the Clinton administration, as Hillary Clinton is expected to win the election. It is true that during his eight years in office Obama blocked all Security Council resolutions that were critical of Israel. However, at the end of his term he may decide to do a more “balanced” approach which may result in the continuation of diplomacy of the two-state solution or, more likely, he will not veto this time the UN Secuiry Council resolution for the establishment of a Palestinian state. While Israel is preparing for a diplomatic battle at the UN over the future of Jerusalem, Judea and Samaria, Obama and Putin might have decided to deal a diplomatic blow to Israel on an unexpected issue, the Golan. It is part of an endeavor by the two powers to use their diplomatic and military cooperation regarding Syria to impose agreements on neighboring countries, such as Israel, Turkey, Saudi Arabia, and Jordan. All of this follows an agreement Obama and Putin had reached earlier (from different perspectives, though) to include in the draft resolution of the Geneva Conference an article that calls Israel to return the Golan Heights to Syria. The UN Golan resolution may triger the war of Gog of Magog, not the Israeli-Palestinian conflict. Also, it is intriguing to note that the second term of the current UN Secretary General expires on 31 December 2016 and Obama’s second term in 20 January 2017, which may not be accidental at all. And I shall give them into the hand of those who seek their lives, into the hand of Nebukadrestsar sovereign of Bavel and into the hand of his servants. And afterward it shall be inhabited as in the days of old, declares Yehovah. But as for you, do not fear, O My servant Ya’akov and do not be discouraged, O Israel. For look, I am saving you from afar, and your descendants from the land of their captivity. And Ya’akov shall return, and shall have rest and be at ease, with no one disturbing. Do not fear, O Ya’akov My servant,” declares Yehovah, for I am with you. Though I make a complete end of all the nations to which I have driven you, yet I do not make a complete end of you1. But I shall reprove you in right-ruling, and by no means leave you unpunished. The name Obama appears again encoded, using the seven letter skip-backward pattern. From right to left starting at the Hebrew word for “from the land” in verse 27, we will find the word אובאמה in the same spelling in Hebrew as in Ezekiel, which is considered to give the most significant results in the very verses dealing with YHVH’s promise to bring the house of Ya’akov back from Babylon. The mathematical probability that even one of these codes, let alone two, would occur randomly in the Hebrew scripture and in perfect agreement with the context of the text is astronomical and cannot be ignored. There is no doubt that as the prophecies in Ezekiel and Jeremiah are written by the Omniscient One, so are the codes in them since a human being is not able to create them. For more on the identity of this “Babylon”, read chapter Will Elohim Use Russia To Judge America?. Thus, we have two witnesses, as required by the Torah, in Exe 38:2-3 and in Jer 46:27-28, which testify the person behind the mysterious end-time Gog of Magog. Without any doubt, as witnessed in the prophecies in Ezekiel and Jeremiah, “Obama” is Gog, and whether he will fulfill his mission as the president of the U.S. or as UN Secretary-General, makes no big difference. The present author, however, gives more weight on the former rather than the latter and the reason for this is that there is a “small technicality” which will prevent the UN bid. There is a unwritten rule between the UN Security Council members that the UN Secretary General cannot be from one of them, but from independent or third world country. The formal decision is taken by the UN General Assembly – but it is always based on “a recommendation” by the smaller and more powerful, the UN Security Council whose members are also Russia and China. By tradition, the UN operates an informal system of regional “rotation” when it comes to choosing its next Secretary-General. For now, the best chances for this position are on the side of the secretary of UNESCO Irina Bokova from Bulgaria who seemingly has the favorable opinion of both the U.S. and Russia. So, it is very unlikely that “Obama” will fulfill “Gog of Magog” in the high UN position, but rather, as a U.S. president. In addition, a strong reaction from Russia and China can be expected against any candidacy of Obama. Therefore, Obama can not be appointed to the UN Secretary General position as the appointment must come from a country outside of the permanent members of the Security Counsel, (Russia, US, France, China, and UK.) Also, it is absolutely certain that Russia and China will veto Obama’s candidacy. The Scripture reveals and Judaism holds the view that a name is a powerful aspect of a one’s identity. The Bible code is commonly used as a method to understand that something or some one will play a role in Elohim’s plan, but how exactly one fits into His plan is open for interpretations. Very often we understand a prophecy when it has already come into being. Therefore, the Bible code is a unique tool for presenting possible interpretations of modern events from a Biblical perspective and the best way to understand it is to keep the mind and eyes open. The codes, embedded in the Bible, are seen in Judaism as the literal Word of YHVH. It is impossible for a human being to create such codes, and if we believe the Scripture is written by the Highest, then we must believe that He has written the Bible codes, as well. Rabbi Glazerson emphasizes that Bible codes exist to strengthen faith in the Heavenly Intelligence of the Torah. What shall be, the name has been called long ago, and it is foreknown that he is a man. And he is unable to contend with Him who is mightier than he. In summary, these are the three contenders for the role of Gog of Magog in the final battle for Jerusalem. Only time will tell whether any of these are the ultimate Biblical rival against Israel. As a matter of fact, the contender is only one: a person with the code name “Obama”. Consequently, the army of Gog of Magog consists not only of Yaphetic tribes (Yapheth being the father of the Indo-European race), who have attained political and military importance, but of Hamitic tribes also. That is to say, of peoples living at the extreme north and east (Persians) and south (Sudaneses and Libyans), i.e., on the borders of the then known world by the Hebrews, not necessarily the world known to us today. Elohim therefore misleads Gog of Magog to an attack upon the people of Israel. Notice, that in Eze_39:2 Gog is represented as an unmanageable beast, which is compelled to follow its leader (Isa_37:29) and compelled to obey the power of Elohim against its will by putting a hook into its jaws. The verb שֹׁובֵב is in an intensive form from שׁוּב and may signify to cause to return (Eze_39:27), and to cause to turn away, to lead away from the right road or goal, to lead astray as found in Isa_47:10. It can also mean to lead or bring away from his previous attitude to undertake a dangerous enterprise. Therefore, Gog of Magog will be reluctant to invaded the land not because he would not want to, but because there may be some considerations of his that may make him reluctant to invade in that particular time, or something else in that matter. Nevertheless, Elohim will drag Gog of Magog down to the land where he will be judged for his wrongdoings. Therefore, for this only reason, Gog of Magog cannot be Iran (Persia), the sworn enemy of Israel, as some suggest, because Iran is not reluctant to attack Israel at all, but on the contrary it has openly stated many times that destruction of the Jewish state is not an option. Nor can an Arab be Gog of Magog for the same reason. Besides the Iranians and the Arabs are not descendants of Yapheth, but of Shem the other son of Noach. What is Gog’s motive to invade the land of Israel? After we have identified Gog and his land, Magog, we may proceed further with prophecy in Ezekiel. According to the prophecy, the nations are all summoned by Gog and gathered together for an attack upon Israel. One motive of Gog of Magog for making the invasion is to be found in the possessions of Israel including the recently discovered oil reserves; a second motive is given in the words: who dwell upon the navel of the earth. This figurative expression is to be explained from Eze_5:5, “Yerushalayim in the midst of the nations” signifying a land situated in the middle of the earth, and therefore a land most glorious and most richly blessed; so that they who dwell there occupy the most exalted position among the nations. A covetous desire for the possessions of the land of Israel and envy at her exalted position in the center of the world, are therefore the motives by which Gog of Magog is impelled to invade the land in which the people live in peace. This covetousness is so great, that even the rich trading populations of Sabaea, Dedan, and Tarshish (Eze_27:22, Eze_27:20, and Eze_27:12) perceive it, and declare that it is this alone which has determined Gog to undertake his expedition. Every one (of the inhabitants of the Land of Israel) will become a trader, trading there until it multiplies greatly, until they are sitting on the middle (umbilical cord) of the land and become the commercial hub of all nations, until the other nations come to them to cancel this trade which they claim is damaging to the world. Notice that this commentary on Ezekiel was made in the 19th century, the state of Israel was not in existence back then. No one even considered the return of the Jewish people to the land much less seeing it as a prosperous nation. But the Malbim noted correctly that other nations attacking Israel for its financial prowess is like a fetus in the womb attacking the umbilical cord that connects it to the source of its sustenance. In other words, what Obama is saying is that the phenomenon of Israel’s prosperity is the greatest obstacle to negotiations between Palestinians and Israel, thus unknowingly Obama fulfilled the prediction of the Malbim made in the 19th century. Hence, we see that the prophecy of Ezekiel is relevant in our time. It will come to pass in the end of days, when the Jewish people will return to the land of Israel. But when they arrive, they will create chaos among themselves and make war on each other… because their beliefs are different. And there God will judge them in sword and blood as stated by the prophet Zechariah, chapter 14. And here the prophet relates how they all will be lost… And between them will there be a war. The first to be utterly destroyed will be the Egyptians, who are the closest to the Land of Israel and will come forward first and fall. Then the Assyrians [Syria] and Persians [Iran] will come to avenge their ally and they all will be destroyed. In Zec_14:2 we understood that even in Yerushalayim not all people will be safe, but half of the city will go out into exile but the rest will not be cut off. Those who will be found in the city will be trapped and surrounded by the opposing armies and will not have the chance to flee. And it shall come to pass in that day, that I will give unto Gog a place fit for burial in Israel, the valley of them that pass through on the east of the sea; and it shall stop them that pass through; and there shall they bury Gog and all his multitude; and they shall call it the valley of Hamon-gog [the multitude of Gog]. The traditional translation of the verse above is quite obscure, we have to admit. It is understood to mean that with the gathering of the weapons of the dead foes for burning (Eze_39:10), the Israelis will do to them what they intended to do to them (Eze_38:12), thus they will obtain the wealth of their foes (see also Jer_30:16). Then, Elohim will assign a large burying place for the army of Gog of Magog in a valley of Israel, which will be named the multitude of Gog, just as a city in that region will also be called Hamonah from this event. The prophecy calls that valley east of the Dead Sea (now Jordanian territory) a place fit for burial in Israel probably because Israel will conquer it by that time by fighting back the foreign armies. And this is where the obscurity comes from: the valley that is designated for Gog’s burial place is also the valley of them that pass through, and the valley somehow will stop them. Those who will pass through are understood to be the Israelis who will bury the fallen of Gog there for seven months long, and after the expiration of that time they will have the land explored by men specially appointed for the purpose, and bones that may still have been left unburied will be sought out, that the land may be thoroughly cleansed (Eze_39:11-16). There are different opinions as to both the designation and the location of this burial place. There is a foundation for the supposition that גֵּי הָעֹבְרִים meaning the Valley of HaAvarim derives its name from the mountains of Avarim as in Num_27:12 and Deu_32:49, a range of mountains on the east of the Jordan River, in the land of Moab (today Jordan), opposite to Jericho; Mount Nebo the burial place of Mosheh is part of this range. It is also possible that the valley may have derived its name HaAvarim הָעֹבְרִים from the Hebrew word avarim, עֹבְרִים meaning “who passed through” hence haavarim, the ones who passed through, since the Israelites passed through that valley when they entered the land led by Yehoshua. By “the sea” we cannot understand “the Mediterranean Sea”, as that would not make a lot of sense, since all the land of Israel is situated to the east of the Mediterranean Sea. Therefore, more properly we may say that this is the Dead Sea as clearly seen in the description of Eze_47:18; and the whole phrase “on the front side of the [Dead] Sea” as looked at from Yerushalyim, is probably the valley of the Jordan, the principal crossing place from Gilead into Canaan, and the broadest part of the Jordan valley well suited to be the burial place of Gog’s armies. And it shall come to pass in that day, that I will give unto Gog a place fit for burial in Israel, the Valley of HaAvarim on the east of the sea. … And there shall they bury Gog and all his multitude; and they shall call it the Valley of Hamon-gog. However, the middle sentence and it shall stop them that pass through in Eze 39:11 is more puzzling than the location of the valley. In order to understand correctly what the text actually says, we need to know that in Hebrew there are two genders, masculine and feminine, and there is no neuter gender; there is no it. The traditional translations render the middle sentence in Eze 39:11 as follows, it shall stop them that pass through. But what is it and how this phrase fits in the context of the burial place for Gog? In the context of verse 11, it could be either the valley which stops the ones passing by, or something else. The Hebrew word for “valley” is gay and is one of these Hebrew words that can be either masculine or feminine. If “valley” [of HaAvarim] and “it” are related then they both must be masculine, since it in the text of verse 11 is hu or “he” in English, and therefore it is referring to the valley gay. However, if gay is faminine, and it being masculine, then it must be something else, not the valley of HaAvarim. And it shall come to pass in that day, that I will give unto Gog a place fit for burial in Israel, the Valley of HaAvarim on the east of the sea. And he shall stop them that pass through. And there shall they bury Gog and all his multitude; and they shall call it the Valley of Hamon-gog. And if it is so translated to mean he, then who is he in Eze 39:11? The only possible answer to this question would be: who else but the Messiah of Israel. It will be Him who will stop the invading armies of Gog of Magog that will pass through the Valley of HaAvarim and there He will bury Gog and all his multitude. The judgment on Gog of Magog will not be confined to the destruction of his armies only, which have invaded the land of Israel, but as it is seen in Eze_39:6 will also extend to the land of Gog and to all the heathen nations that are dwelling in security. By this judgment YHVH will make known His Name in Israel, and show the heathen that He will not let it be blasphemed by them any more. To show how terrible the judgment upon Gog of Magog will be, the prophecy depicts in three special ways the total destruction of the invading forces: (1) the burning of all the weapons of the fallen foe will furnish the inhabitants of the land of Israel for seven years, so that there will be no necessity for them to fetch fuel (Eze_39:9-10), (2) Elohim will assign a large burying-place for the army of Gog in a valley of Israel, and (3) Elohim will provide the birds and beasts of prey with an abundant meal from this slaughter. When will the invasion of Gog of Magog take place? invasion will be the final battle for Yerushalayim after nine months of siege (Eze_39:17, Rev_19:17-18). Now, the important question to ask is: when will the war of Gog of Magog take place as related to the Messiah’s coming: before or after His coming? The understanding of the present author is that it will take place in the latter days of this world as Eze 38:8 indicates or before His coming. However, Maimonides, the greatest authority of Rabbinical Law and Tradition said in Mishneh Torah, Hilkhos Melakhim 12:2 that, “The plain meaning of the words of the prophets seems to indicate that the war of Gog and Magog (that is Gog of Magog) will take place at the beginning of the Messianic Era” . First, what does Maimonides mean by the Messianic Era? Does he mean that the Messiah will be revealed first and then He will usher the world into the Messianic Era? Because without the Messiah there would be no Messianic Era. Therefore, Maimonedes taught that the War of Gog of Magog will start shortly after the Messiah’s arrival. After many days you (Gog) shall be called up. In the latter years you shall come into the land of those brought back from the sword and gathered from many people on the mountains of Israel, which had been a continual waste. But they were brought out of the nations, and all of them shall dwell safely. (Eze_38:8). I will go up to the land of unwalled villages; I will go to them that are at rest, that dwell safely, all of them dwelling without walls, and having neither bars nor gates. We should note these important conditions of Gog’s invasion: (1) Gog of Magog will attack Israel only when Israel is reunited and (2) at rest and safety, having neither bars nor gates. Such a description of Israel being safe and well seems to point to the Messianic time which, according to Maimonides, and we should agree with him, will take place at Messiah’s arrival. And when the days of the Messiah arrive, Gog and Magog will come up against the Lord of Israel, because they will hear that Israel is without a king and sits in safety. It seems that the ancient Sages give more weight on the scenario according to which the Messiah will come before the war of Gog of Magog. However, in order to determine the timing of the Messiah’s coming, we need to ask this question: is the State of Israel truly living in security and safety today? No, not at all! Israel is surrounded by hostile Muslim states which do not recognize the right of Israel to exist and threaten to wipe them out as a nation, and let the name of Israel be remembered no more. And indeed, Israel literally dwells behind walls and security fences, Iron Dome anti-missile defense system, at the verge of a next war with Hamas, Hezbollah, Syria, and Iran. By no means does Israel dwell in safety and security. It has become a defensive fortress among many evil neighbors and the possibility of a future war to break out is about when not if. It is only after the defeat of the hostile nations as stated in the prophetic Psalm 83, that the Israel will dwell safely spoken by Ezekiel. Perhaps, that is why the names of the neighboring Arab nations are not mentioned among Gog’s armies. However, we see in Ezekiel 38 and 39 nations belonging to the second ring of hostile nations around Jerusalem like Persia (Iran), Kush (Sudan), and Put (Libya): all sworn enemies of Israel. Because the Messiah has not yet come, the House of Israel is not reunited and does not live in safety, and the Messianic Era has not begun. Then, when will the war of Gog of Magog take place: before or after the Messiah’s comming? In the latter days before the Messiah’s coming, as many expect, or after His coming? This is the day of which I have spoken. And those who inhabit the cities of Israel shall go out and set on fire and burn the weapons, both the shields and armour, the bows and arrows, the clubs and spears. And they shall make fires with them for seven years, and take no wood from the field nor cut down any from the forests, for with the weapons they make fire. And they shall plunder those who plundered them, and loot those who looted them. And it shall come to pass in that day, that I will give unto Gog a place fit for burial in Israel, the valley of them that pass through on the east of the sea; and He shall stop them that pass through; and there shall they bury Gog and all his multitude; and they shall call it the valley of Hamon-gog. And the house of Israel shall bury them for seven months, in order to cleanse the land. The burning of all weapons of the foreign armies will furnish the inhabitants of the land of Israel with fuel for, notice, seven years. The reason here for burning all weapons of course is the complete annihilation of the enemies and the removal of every trace of them. However, there is also another reason for burning the weapons. According to Isa_9:5, weapons of war are irreconcilable with the character of the Messianic times of peace. The number seven in the seven years of burning as well as in the seven months of burying is not just symbolical, but a punishment inflicted by Elohim and the completion of His just judgment since number seven is a number of perfect completion. Only when the war is over and the land is cleansed from all impurities therein, only then everything will come to completion and the Messianic Kingdom will be ushered. The Messiah, not IDF, is the one who will destroy the armies of Gog of Magog and the one who will take up his throne and restore the glory of the Temple and the Temple service in its fullest extent. This could only be possible when the restoration of Temple follows the Messiah’s victory. In Chapter Redemption Plan of YHVH of Part I of this book, we studied that there are two ordained times for the Messiah’s coming. The one is — the preordained time by the Creator at the beginning of Creation and — a hastened revelation before the destined time — all depending on the Covenant requirement of repentance. We also learned that 6,000 years have been set unconditionally for mankind to labor. However, when Elohim has said in its time I will hasten it, what it means is that there is a set date that may occur earlier than its predetermined time. There is an explicit verse in Mal_3:1 that says, “The lord whom you seek (the king Messiah) will suddenly come to his palace …” and we came to the conclusion that there are the two reckonings as defined in Chapter Redemption Plan: (1) “in its time” 6,000 years of the Redemption Plan and (2) “in the hastened time” 6,000 years of the Labor of Man Plan. and only then the Millennial Kingdom is established. then the Millennial Kingdom is established. Neighter of these two scenarios contradicts the prophecy in Ezekiel 38 and 39. As said in the beginning of the chapter, Zechariah’s prophecy about the War of Gog is the darker of the two. According to it, Israel will be the focus of Gog of Magog in his war, with the battle being waged in Yerushalayim. While the prophecy in Ezekiel, Gog and land of Magog, and his destruction will be in the focus of Elohim’s wrath, not Israel. Now, in order to determine with a greater precision the heathen power rising up in Gog of Magog against Israel, we must take into consideration the passage in Rev_20:7-9 from where the prophecy of Gog of Magog is resumed. Here, we have to say that there are two separate occurrences involving Gog of Magog in the Scripture as found only in Ezekiel and Revelation. The details are important in order to distinguish the two events. In Eze_38:2-6 a specific group of nations are mentioned led by Gog of Magog, their attack on Israel comes from the north. In Eze_38:9-18 Gog and Iran, Libya, Sudan, etc. come against the land of Israel. In Rev_20:9 it mentions that Gog of Magog surround the “beloved city” which is Jerusalem. In Eze_38:19-20 there will be a great earthquake. In Revelation 20 the fire came down from Elohim out of heaven and devoured them. In Eze_38:21-22, the armies are so confused they begin to fight each other and pestilence rains down on them, great hailstones, fire, and brimstone. In Eze_39:11-12 so many bodies fall that it takes seven months for Israel to bury them all. This multitude is buried in the Valley of Hamon-gog. Armageddon is a separate event from these two events. In Rev_20:7-8 the nations from the four corners of the earth are gathered together with Gog of Magog (perhaps descendants of the original Gog) but led by Satan against Jerusalem where the camp of the saints is located. According to Jewish tradition, there are actually meant to be three battles of Gog of Magog. According to Rabbi Israel Meir Kagan (1838–1933), otherwise known as the great and venerable sage, the “Chofetz Chaim,” two such wars have already occurred. They were World War I and World War II. The first, he himself lived through, whereas as the second he correctly predicted but did not see it. It is the third and final one which is to come. In conclusion of the whole matter, the question we need to ask is this: are the prophecies in Zechariah and Ezekiel concerning the invasion in Israel one and the same or two different ones? If both prophecies speak of the same invasion, do they speak also of two scenarios of the invasion of Gog of Magog and differ only in the darkness of prediction depending on the faithfulness of Israel? In order to answer these questions, we need to know whether a prophecy is a set on stone prediction or open for interpretations. Precisely because Judaism believes in free will, the human future can never be unfailingly predicted. People are capable of change. God forgives. As we say in our prayers on the High Holy Days: ‘Prayer, penitence and charity avert the evil decree.’ There is no decree that cannot be revoked. A prophet does not foretell. He warns. A prophet does not speak to predict future catastrophe but rather to avert it. If a prediction comes true it has succeeded. If a prophecy comes true it has failed. If R. Sacks is right, we may expect some variations from the prophecy of the war of Gog of Magog , all depending on Israel’s repentance. If Israel as a nation turns to her Elohim for protection and says, “Blessed is the one who comes in the Name of Yehovah“, the prophecy in Ezekiel may be fulfilled. If not, then the prophecies in Zechariah. All depending on Israel’s repentance. If Israel repents and calls on the name of YHVH, the Ezekiel scenario may take place. However, if the nation does not, or make a grave error concerning the dividing of the promised Land, then the Zechariah scenario will come upon the nation. The reader may want to consider also a third scenario of the war of Gog Magog in the prophecy of Zechariah 9-11.